Multiple Meaning Words - Which Meaning is Being Used? 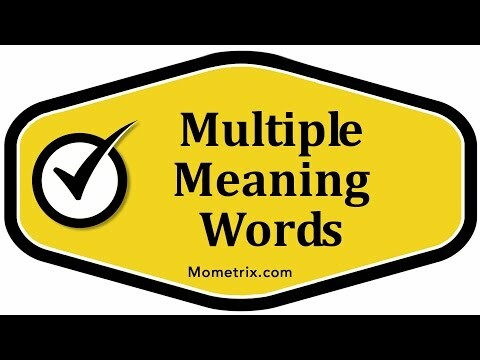 > Multiple Meaning Words – Which Meaning is Being Used? Multiple Meaning Words – Which Meaning is Being Used? There are some words that have multiple meanings. Due to this, it can be difficult to determine which meaning is being used in a sentence. There are a few steps you can take to analyze which meaning is being used. You can check whether it is being used as a noun or a verb, or another part of speech. This can be a quick determiner and can aid you in moving past these words quickly; however, not all words will be this easy. Sometimes, each meaning of a word can share a part of speech. When this happens, it is best to look at the context of the rest of the sentence and determine which definition would fit the sentence. Some words are spelled exactly the same, but they have different meanings in different contexts. You have to look at context clues to figure out which version of the word you have in your sentence. One way you can do that is by looking to see if the word is a noun or a verb. The grammatical category that the word is can determine what the word means and vice versa. If you aren’t sure of the pronunciation, but you know which version of the word is being used, you can figure out what the part of speech is. Let’s look at our first example: Trip. Trip can be a vacation, which is a noun, or it can mean to fall over something, which is a verb. Let’s look at our sentences. “She took a trip to Colorado.” “If you aren’t careful, you might trip over that step.” In this sentence, “She took a trip to Colorado,” she’s taking a vacation, so you know this is a noun. Alternately, you could say, “Oh, a trip is a thing you might take, so it’s a noun. It has to mean vacation.” “If you aren’t careful, you might trip over that step.” This one is being used as a verb, so you know it means you might fall over that step. Alternately, you could say, “You might trip over that step. Oh, in this sentence, trip is something you’re doing, so it has to be a verb in this sentence. Either way, finding out if it’s a noun or a verb can help you figure out which version of the word you’re using in that sentence. Let’s look at another example: Degree. Degree has at least three different meanings, and this one’s a little trickier, because they are all nouns. Unit of temperature is a noun. A title earned at graduation, if you earned a degree in astrophysics, that is a noun. The amount or extent of something is a noun. Finding the part of speech won’t help you determine meaning with this particular example, but reading this sentence and using context clues can help you figure out which one we’re talking about. “He didn’t notice when the temperature rose 1 degree.” In this one, he didn’t notice when the temperature rose 1 degree. You can look at “temperature” to know that this one is talking about a unit of temperature. You’re using your context clues to figure out the meaning of this word. Our next one: “The business is only hiring someone with a degree.” So are they hiring someone with a unit of temperature? Everyone has a temperature of something. Are they hiring only people that have earned a title through graduating, or are they only hiring people with an amount or extent? That one didn’t really go any further, so it wouldn’t be the amount or extent of something. This one, if you sub in their title earned a graduation, this business is only hiring someone who has graduated. This one is going to have to do more with title at graduation. Then our last example: “It was hard to tell the degree to which he really cared about the outcome.” In this one, was hard to tell the temperature to which he cared about the outcome, the title earned a graduation, or the amount or extent to which he really cared? In this one, it’s the amount or extent to which he cared. Maybe he didn’t care that much about this, so it was hard to tell. Maybe he was keeping his emotions inside, so it was still hard to tell the degree to which he cared. Whenever you’re finding words that could mean more than one thing, our special multiple meaning words, you want to look and see the context around the word. Look at the whole sentence to see what would make sense. If you know multiple meanings of a word, try each definition that you know to see which one makes it so you’re understanding the sentence correctly. Those multiple meaning words can be tricky.